Translated by Washington D. C.
Come to our lives, to our hearts, to our consciences. Move our intelligence and our will to understand what the Father wants to tell us through his Son, our Lord Jesus, the Christ. May your Word reach us all our life and create new life within us. 14,13When Jesus hear of it, he set out by boat fir a secluded place, to be alone. But the people heard of it, and they followed him on foot from their towns. 14,14 When Jesus went ashore, he saw the crowd gathered there, and he had compassion on them. And he healed their sick. 14,19 Then he made everyone sit down on the grass. 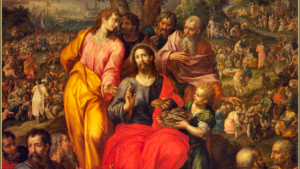 He took the five loaves and the two fish, raised his eyes to heaven, pronounced the blessing, broke the loaves, and then handed them to the disciples to distribute to the people. 14,20 And they all ate, and everyone had enough; then the disciples gathered up the leftovers, filling twelve baskets. 14,21 About five thousand men had eaten there, besides women and children. St. Matthew, is one of the evangelists, who describes this miracle that we refer to as the one of the multiplication of bread and fish. It is a literary genre used to show Jesus as the Messiah, the new Moses. This Scripture passage is the continuation of the martyrdom of John the Baptist. This text states that Jesus went out of town immediately and to be alone in a place. He went to an isolated place. Even though the text does not mention it, we presume that Jesus needed to be alone after receiving the news of the martyrdom of John. We infer from the text, that Jesus came to a quiet and isolated place. But the people were following him and when he came ashore, he saw them and his heart was moved with compassion. In another text, we find a description on the people and it states that the people looked like sheep with no shepherd. Maybe, versus 14 is the one that gathers the central subject of the theme. It states that Jesus is moved deeply to the heart (with mercy and compassion that he suffers with and for them). It is the suffering of God himself who hear the cry of his people. The Scripture text mentions that Jesus healed the sick there and it should finish there. But there is something new about to happen. It is Jesus’ disciples who see the crowd coming from afar, and that they are in a deserted place closet o sun down and will need something to eat. They suggest Jesus to send them away so they can go and get something to eat in the nearby communities. The disciples see the need of the people, but on the other hand, they are not providing a solution. Jesus gives them a different answer and asks them to feed the people. 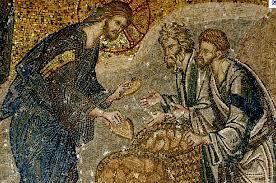 The disciples bring five loaves and two fish that they had to share. That was not enough to feed the big crowd but even smaller for their faith and expectations. It is here where the scripture text and the literary language change. 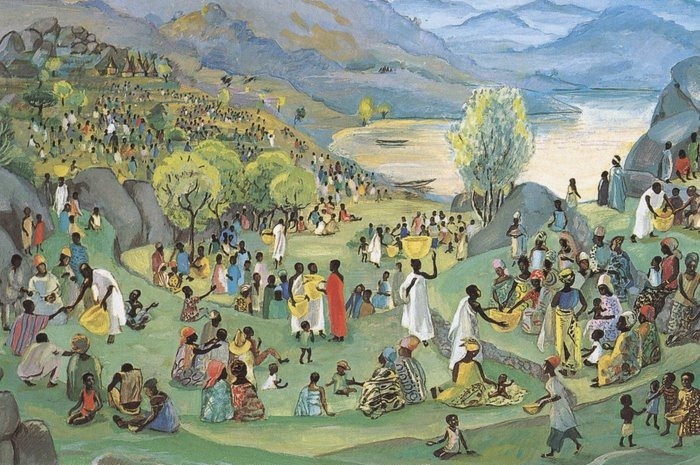 Jesus asks his disciples for the bread and fish, he made the crowd sit on the grass, and pronouncing the blessing and giving thanks, he hands the bread and fish to his disciples to distribute them. All gathered there ate and had enough. The passage ends up with the leftovers that made up twelve baskets. Jesus as the centerpiece of this Scripture passage is shown as the Son of God, who has mercy on the human kind. The text is used just to support this main idea. The first one points at the messianic meaning of this miracle. Jesus is shown as the new Moses who feeds the crowd, as it happened in the dessert with the manna. The second idea is an ecclesial principle. 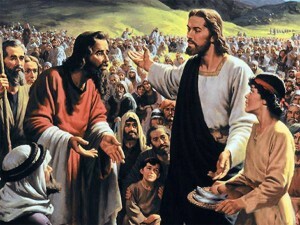 Jesus asks his disciples to distribute the bread and fish. 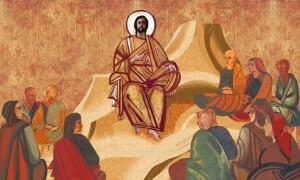 It is the picture of the Church alive preaching the Gospel and sharing the Bread. The third one is the Eucharistic signs and symbols. We find in the passage the use of some verbs like take, bless, break, and give and of course, the memory of the “sunset”. Finally, the twelve baskets show the missionary dimension of the Church. It must feed the humanity who hungers for God in the apostolic dimension (twelve disciples). What had just happened to Jesus? Where is he going to? What do the people who were following Jesus do? What was Jesus attitude when he saw the crowd? What did Jesus do with the sick among the crowd? What did the disciples tell Jesus? What did they tell Jesus about the crowd? What did he answer them? How did the disciples respond? What did Jesus do then? What happened with the crowd? What did they do with the leftovers? What is the end of the Scripture text? How many people were in the passage? What does the text is tell me or us about? Am I brave enough to strongly follow Jesus, even in isolated roads? Do I look for Jesus sight with a need of somebody who really wants him to look at? I have in my life many and different diseases, that mostly are the result of the absence of the Lord. Most of them are spiritual diseases. Do I ask the Lord to heal me? I feel, sometimes like the disciples, who do not know how to respond to a certain situation and the best way to get out of it is to dismiss everyone. Do I understand that Jesus is asking me to feed the people? How many times do we tell the Lord to feed the hungry crowd Himself? Am I able to listen to God´s voice who says “Feed them yourselves”? How big is my faith? 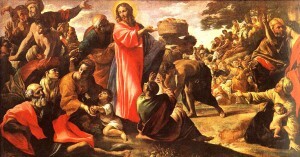 Am I able to bring my five loaves and two fish to the Lord so He can break them? What does sharing mean to me? Who do I should share my life, my talents and my belongings? Where is the Lord taking me to? Do I understand that in the Church there is enough to share? What is my missionary attitude? Can I review it today? What do I or We tell to the Lord? Thank you, Lord, for your Word of Salvation! Thank you for joining us in the deserted moments of our life. Thank you for being there for us, for coming to heal us. Lord, enlighten our lives and minds to acknowledge your presence in our charity actions that we offer in your name and not in ours. Thank you, Lord, for giving us the opportunity in attending our most needy brothers. Help us, Lord, to be able to share our five loaves and fish and not to be selfish and keep them ourselves. Help us, Lord, to bring them to you, so you can break them and we can share them with the Church and one day we can be one in your name. Help us, Lord, so the Church be the center point of our mission and we do not feel alone. How do I or We internalize the text? For this moment of contemplation, we can repeat the following Gospel verse so it enters in our lives and in our hearts. This way, we start the contemplation moment by repeating and asking Jesus to come to us. What do I or We commit to? There should be a change in my life. If there is no change, I am not a true Christian. If I am alone: I can read one more time the Scripture text and following the text, I can hear Jesus who says, “Feed them yourselves”. I should look for people who really need to be nourished with food and with the Word of God so I can share with them. I must plan a concrete action to help the needy. Pay attention, so you do not let this opportunity that the Lord put in your path, to pass by.